But, but...how do they strike fear into the hearts of criminals? 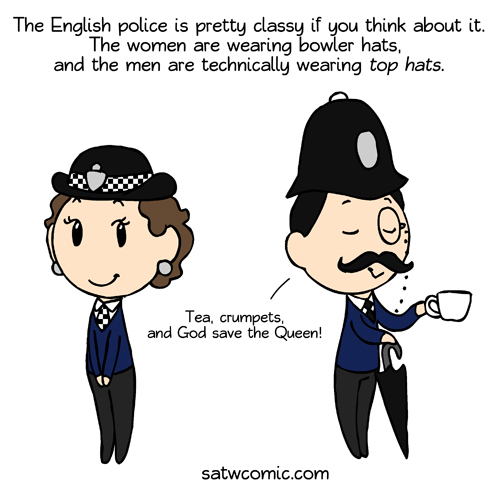 I mean, the bowler hats should at least have spikes on them. And the umbrella should have a concealed blade, or wand (like Hagrid). when I read your comment I imagined a group of soldiers walking with pink umbrellas. Pip pip cheerio, my good sir! Would you care for a spot of tea? The women wear bowler hats because Dark Overlord Merkel took all their guns before the brexit so now they have James Bond oddball hats they throw at criminals. They do have guns, but only if they're in a specially trained department, and even then they have to go through files of paper work for each bullet, and they can't fire unless they've been given permission by the top leaders of the police, and even then it's extremely rare. But every police officer has pepper spray and a collapsible truncheon (a metal rod covered in swimming noodle foam) that leaves a nasty bruise if they hit hard enough. Plus it's only just recently that they've managed to reduce their violent stigma- it was known, during the 70's especially, they'd use light torture to get a confession out of those they thought were guilty.